I heard about Tinga first from the Eater blog – a just-opened taco shop founded by longtime caterers featuring a gourmet-style menu and a designy space. Owner Jerry claimed that his enthusiasm for tacos dates to his first visit, back in 1986, to the famed Taquería la Super-Rica in Santa Barbara. Super-Rica, renowned for being praised by Julia Child herself, exceeds even Yuca’s Tacos according to my new technique for identifying the objective index of hype: the number of times the word “best” appears on the first page of Yelp! reviews. Super-Rica rates a score of 25. 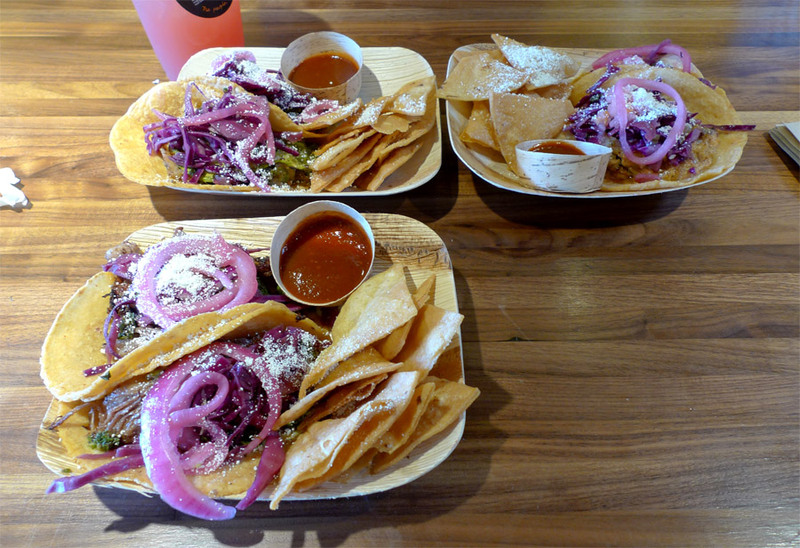 Super-Rica is pretty darn good, and it has the character and feel of a righteous, working-class taco shop, but one with an especially interesting and diverse menu. Tinga is clearly not cut from the same cloth, so the comparison is misleading. The more relevant comparison for Tinga is to Lotería Grill (which incidentally, scores a mere 18 on the Yelp! hype index). Carmen and I met Jany and Chris here for lunch today. 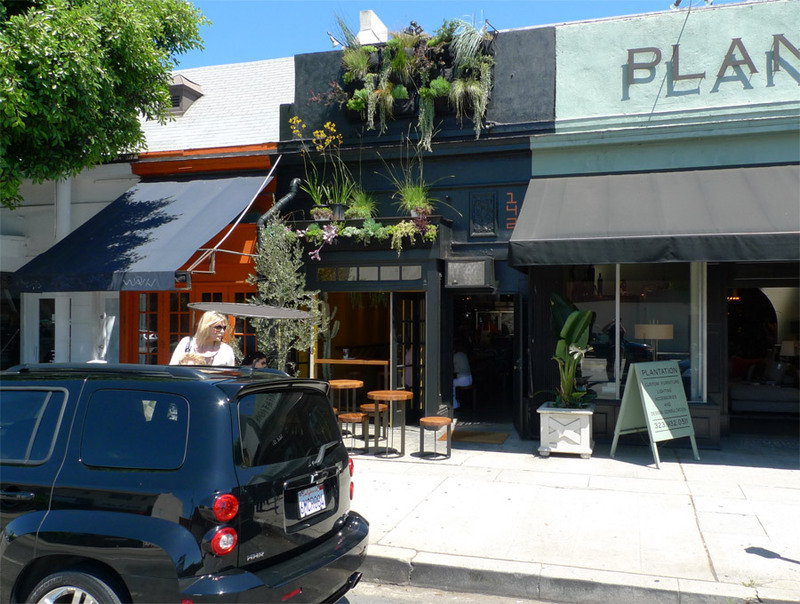 I recognized Tinga’s narrow storefront on La Brea from the photos I had seen online – narrow, painted out black, covered in trendy wall-planting pockets, and lacking any kind of signage. The cool interior seats about 20; the music was loud, and mid-meal they treated me by playing Scritti Politti. Tacos are served in plates of two, for $5.50 to $8.50 for the pair – comparable to other gourmet-style taco shops like Lotería and CaCao – although one is compelled to order them by the pair, so if you want variety, plan to share. Each order comes with a handful of tortilla chips of the best kind – thick, oily, just fried, and extra crunchy – and a saucer of tasty, smoky rojo. Carmen and I shared orders of the papas bravas, short rib deshebrada, and cochinita pibil tacos. I had an horchata, probably the thickest, strongest horchata I’ve ever had. When the tacos came out, I was impressed by the striking blue and purple hues, beautifully contrasting with the red of the salsa and the yellow of the tortillas and chips. Each pair is served on an eco-friendly plate made of fallen tree leaves. I was also struck that all the tacos look the same. But rest assured they don’t taste the same beneath the cool garnish. First I ate the short rib taco. The meat was nothing like Korean barbecue short rib, but rather more like what you get when you order the braised short rib at a European-style restaurant. It was tasty, with complex meat texture, but I felt like the subtlety of its fine taste and texture was somewhat drowned out by everything else going on – the corniness of excellent handmade tortillas, the tanginess of the salty cheese, the starchy chunks of potato. These ostentatious tacos are pretty big, too. It seemed gratuitous to be eating so fine a taco as a taco per se. In contrast to the rather anemic gourmet tacos you find at Lotería Grill, these are kickass. Next I ate the cochinita pibil. Anywhere they have pibil, it’s a major attraction and one must pay heed. Here the pibil, described on the menu as “72-hour pork”, is fine and meaty. The onions are citrus-pickled, and there is a delicious, potent citrus-habanero salsa, with big visible chunks of habaneros, guaranteed to transform your mouth into a festival. This compelling taco is a new favorite and destined to haunt my daydreams. Finally I ate the papas bravas taco, with potatoes and peppers – a great vegetarian taco. The potato chunks, exteriors given toothy resistance by being cooked I-don’t-know-how, are satisfying. The taste is great. I imagined a potential outcome that Tinga would annoy me by being too upscale and bourgeois, but I found it a very worthy and enjoyable addition to the world of gourmet-style tacos. What is the white powdery substance sprinkled on top of everything in the plate? I believe it is Cotija cheese. Often I encounter white grated cheese in Mexican food that seems to have no taste, but this stuff was conspicuous and pretty tart, and something like good Parmesan cheese. The pibil is so spicy! but very yummy. and 72 hours? really? i’m sure it was just as delicious if not better at 48.